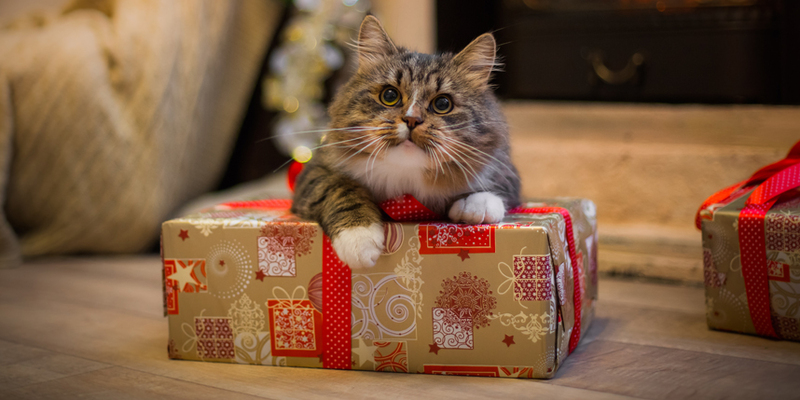 With the holiday season coming up, learn how to achieve a cat-proof Christmas tree and help prevent cat stress, so both you and your feline can enjoy the festive season! Having a place that feels comfortable, is out of the way, and smells like home can provide your cats with a sanctuary to escape to when they are feeling overwhelmed. This may be a cat bed with one of your T-shirts in it, or maybe just a spot under the tree where your cat is shielded but can keep an eye on the home. Consider keeping your cat confined to one space that has all of their provisions so they aren’t exposed to as much of the excitement. Whenever the chaos and the crowds die down, make sure to spend some time snuggling with your cat to let them know that the excitement is over for now and that things can go back to normal. 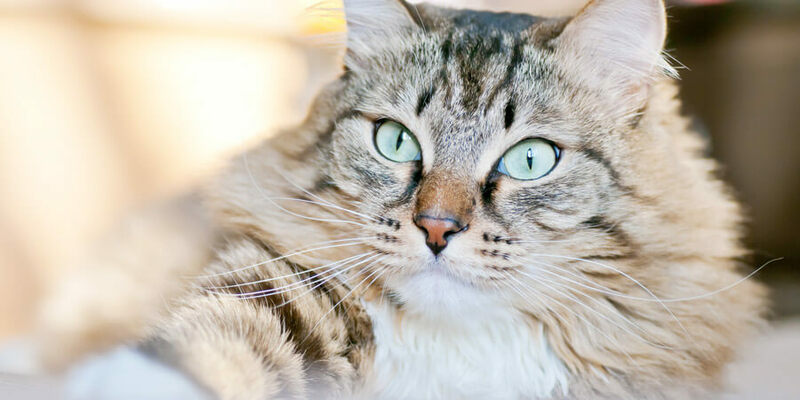 Some cat anxiety is to be expected during the holiday months, but if you notice your cat isn’t eating normally or using the litter box as often as usual, these may be a sign of more severe cat stress. This can sometimes lead to illnesses, so you should take extra precautions at this point, and contact your veterinarian if you notice anything unusual. 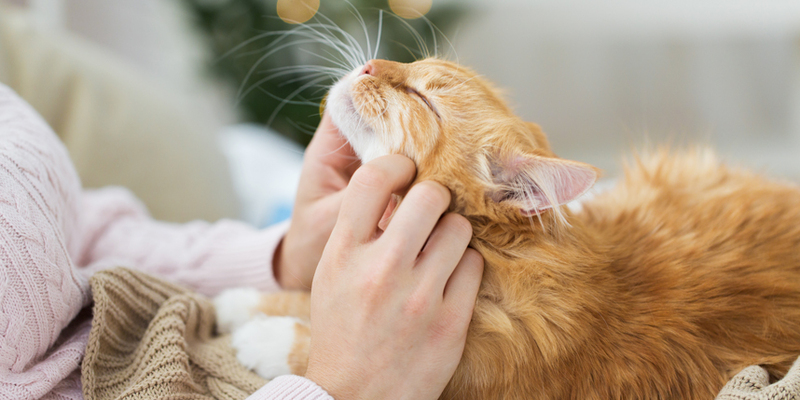 Soothing flower scents or feline facial pheromones, such as Bach Flower Remedies or Feliway® , can assist your stressed cat in feeling at ease. 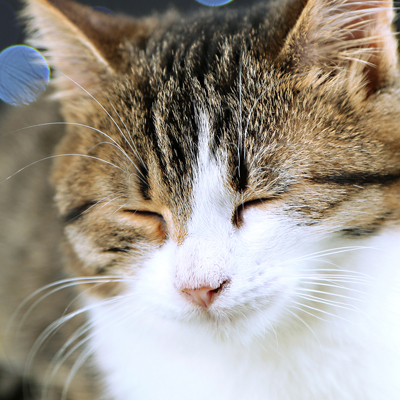 You can also reduce stress for both you and your cat by keeping the litter box clean. With the naturally concentrated power of corn, World’s Best Cat Litter™ lets you do more with less, so you don’t have to worry about your litter box during this busy season. Cats, especially older cats, cope better with stress when they have a routine they can stick to. 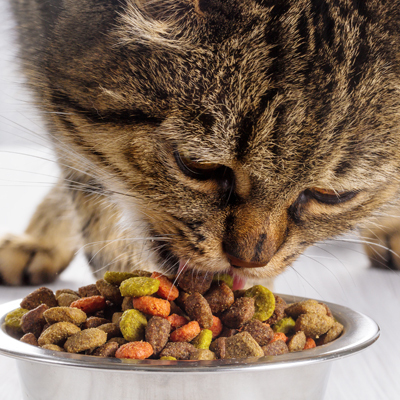 So if you normally feed or walk your cat at certain times of the day, you should try to stick to a set schedule. Don’t forget to make time to play with them regularly and show affection, so they don’t start to feel thrown off balance. 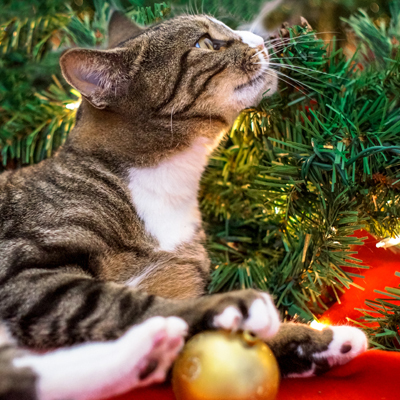 Though there is no definite way to guarantee your cat won’t find a way to cause mischief, there are ways to prevent some of the most common Christmas tree accidents. The easiest fix is to only use plastic or unbreakable ornaments, so there is no risk of broken glass, and to hang them securely and up high, out of your cat’s reach. Covering your tree’s water with a tree skirt can prevent your cat from drinking the water while it has added tree food. Spraying ornaments or decorations with apple bitters or citronella can keep your cat from chewing or playing with them. Covering electrical cords with cardboard tubes or plastic can also prevent unwanted chewing. 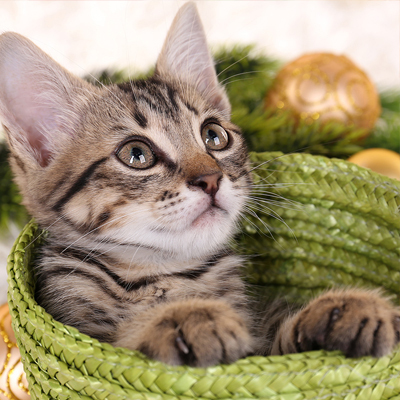 Avoid tinsel, as well as holly, mistletoe, and poinsettias, because these plants are poisonous to cats, and tinsel is dangerous for the digestive system. 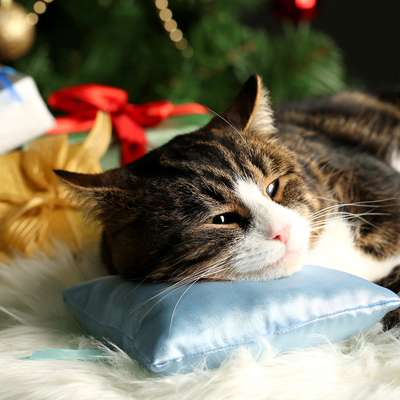 Not to worry, though, applying these tips and making sure not to leave your cat alone to cause trouble can keep your house festive and safe for the holidays! 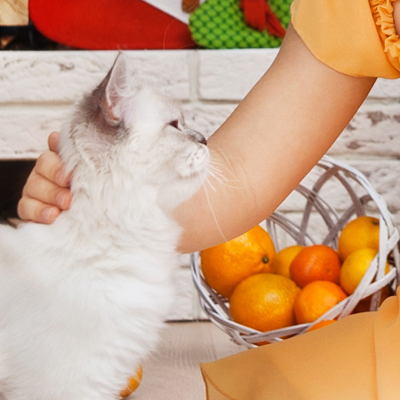 The holidays may be known for causing stressed cats, but with a little extra love and some preparation, your home can be a safe and happy environment for your furry family member. 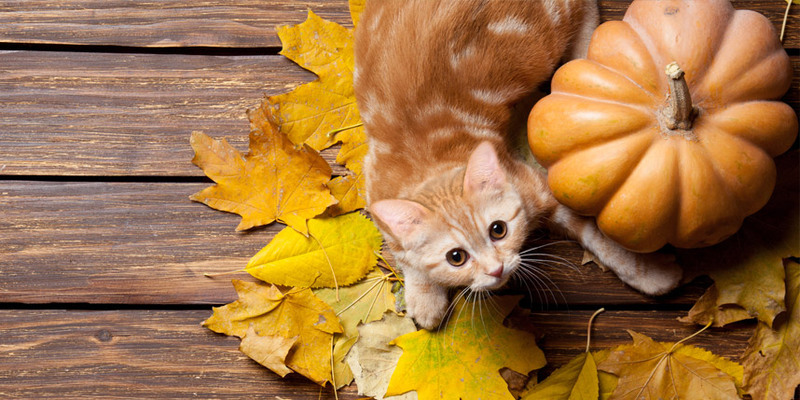 Tips for living well with your cat or kitten during the Thanksgiving holidays. It’s smart cat care, for happy cats!